FLASHBACK: The derelict ruins of the Tuahine Point lighthouse we now view as part of the iconic view out from Wainui Beach was in fact the third lighthouse built at the tip of the Tuahine headland. 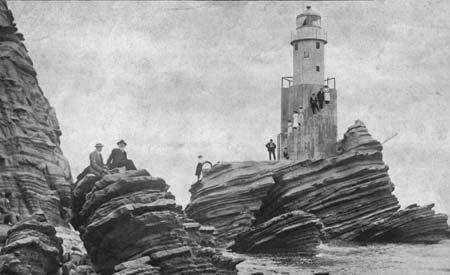 Two earlier lighthouses were erected on the rocks nearby. The first built in 1905 was completely destroyed by fire just two months after its commissioning. 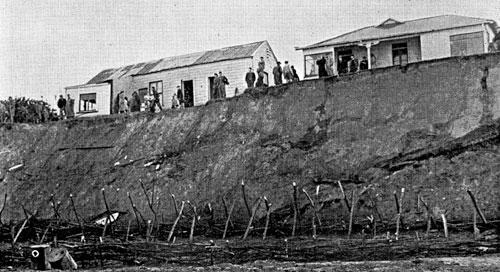 A new cast iron structure came into service in 1909 and just a year later was severely eroded by landslides and declared unsafe. The concrete tower and lighthouse pictured above was built in 1911. Picnic excursions to the lighthouse were highly fashionable in the early 1900s. This lighthouse was turned off in the 1950s when it was replaced with a new electric system sited on top of the headland. FLASHBACK: The original Wainui Beach surf life saving clubhouse at Okitu circa 1937. 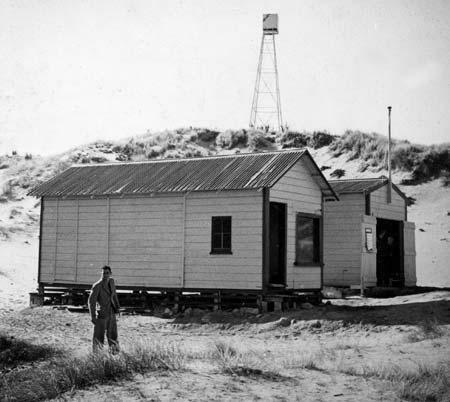 The near building was the clubhouse with the boat shed built alongside and the patrol tower on the dunes above. Club member Jack Campbell is pictured. The Wainui SLSC is now in its 71st year. 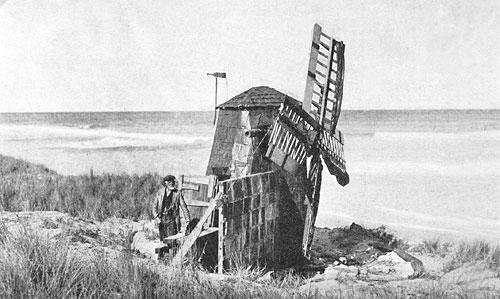 FLASHBACK: The old windmill on the sand dunes along Wairere Road. Built by Frederick Ottaway around 1916. FLASHBACK: Photographic proof that the sand at Wainui Beach comes and goes. The spikes used to fasten these fascines (bundles of brush and branches), which were installed along this section of foreshore near “Schools” circa 1950, were revealed for the first time in 60 years after winter storms in 2009.